as a double glazed glass option. Thermoformed Rooflights - Triple, twin or single applications from our standard range, 3mm UV protected outer skin / 3mm thick inner skins. Comes with a manufacturers discolouration and impact resistance guarantees. Glass: - Most applications can be incorporated, but in the main, Georgian wire is specified to give a half hour fire resistance. The kerb is supplied fully assembled ready for fitment to roof structures, the kerb should be fixed at 300mm centres. 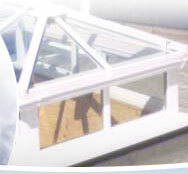 Thermoformed Rooflights - Are supplied seperately to kerb, and should be bolted to the opening frame - sealer washers, caps & roofing bolts with nuts are supplied as standard for this purpose. Glass - Applications will be riveted or security bolted as required. Cleaning - Rooflights should be washed down with mild detergent and warm water. Do not use abrasives. When placing as enquiry / order please be sure to note the roof opening size, and where possible, the width of the upstand kerb.